I will be teaching these 2 cards in my upcoming Valentine card class. The first one is a tri shutter card. This one is done with Brown & Foxy bazzill card stock. The patterned paper is Madeline Painted Roses from K & Company. 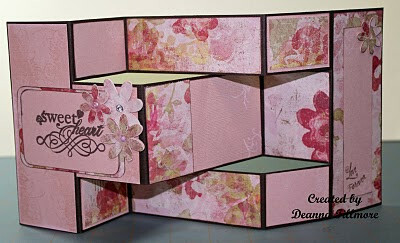 The Sweetheart stamp is from the Love with a Flourish stamp set by Autumn Leaves and the Love Forever stamps are from the Crafty Secrets Cherish set. It is hard to see in the picture but there are some other images stamped with pink inks and versa mark ink. 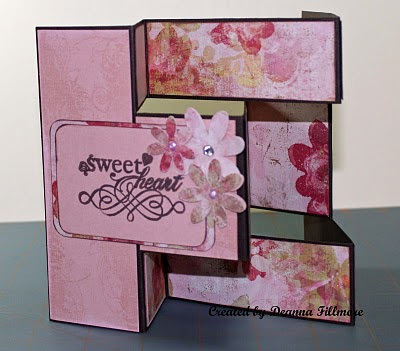 The front panel is stamped with designs from the Flourish Edges stamp set by Basic Grey. The next card is done using flock and glitter. I did this much the same as you would do the burnished velvet technique. 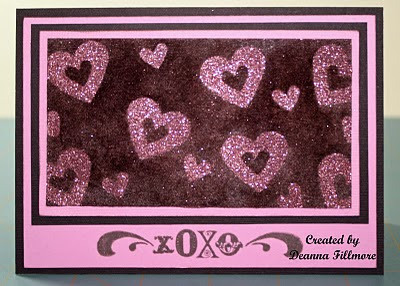 I did the flocked background first and then the pink glitter hearts. The card stock is Mud Pie and Petunia. I used chocolate lotto fun flock and micro fine rose copper glitter ritz glitter. The xoxo stamp is from the Autumn Leaves Love with a Flourish stamp set.